English is known for its richness of synonyms, and words for supernatural spirits are no exception. You’d think communication would be served by one or two words for ghosts, but no, English feels the need for dozens. In honor of Hallowe’en, therefore, here are a few of them, with some of the etymological stories behind them. ghost - From Old English, before we gained all those other synonyms, this could mean all kinds of spirits, angels, demons, soul, breath… It was the word available in Old English to translate the Latin Bible’s Holy Spirit, which is why we hear of the Holy Ghost, thus confusing generations of Christian children. It remains, however, our most basic word for the spirits of the dead that may remain to haunt the world of the living. phantom - Ultimately from the Greek root phantazein “to make visible,” it reached English around 1300 by way of French, by way of Latin. However, it meant “illusion” first and didn’t come to be applied to ghosts until the end of the century. apparition - Ultimately from Latin apparitionem “appearance,” in English this was first used for Epiphany: the appearance of the Christ Child to the Wise Men. A century later, about 1600, it had begun to mean “ghost” from that same sense of a startling supernatural appearance. 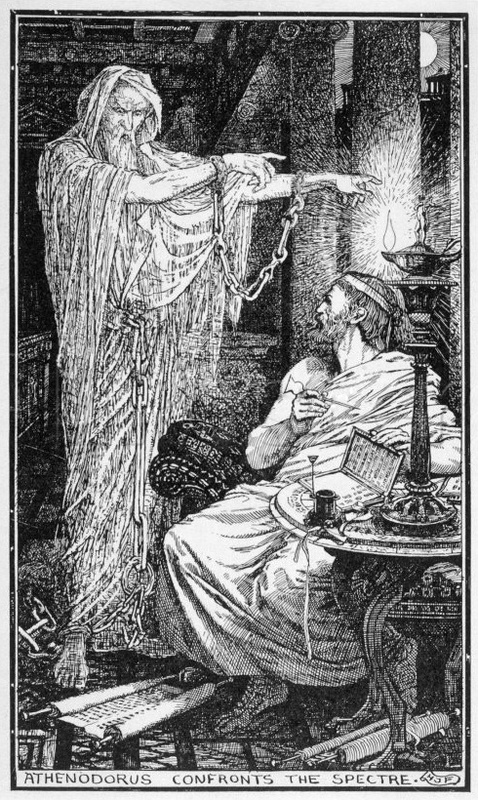 eidolon - Another “appearance,” borrowed from Greek in 1801, in English this meant “ghost” first, and later came to gain the meaning “an ideal image,” which is quite an upgrade. haunt - As a synonym of ghost, this dates to mid nineteenth century African-American vernacular, but the original meaning of the verb was “to frequent, to visit,” so a haunt is a spirit that hangs around in a particular place. shade - It’s easy to see how a dark or shadowy thing could come to be a metaphor for a ghost. English made this leap in the 1610s. spirit - Not all spirits are of dead people. 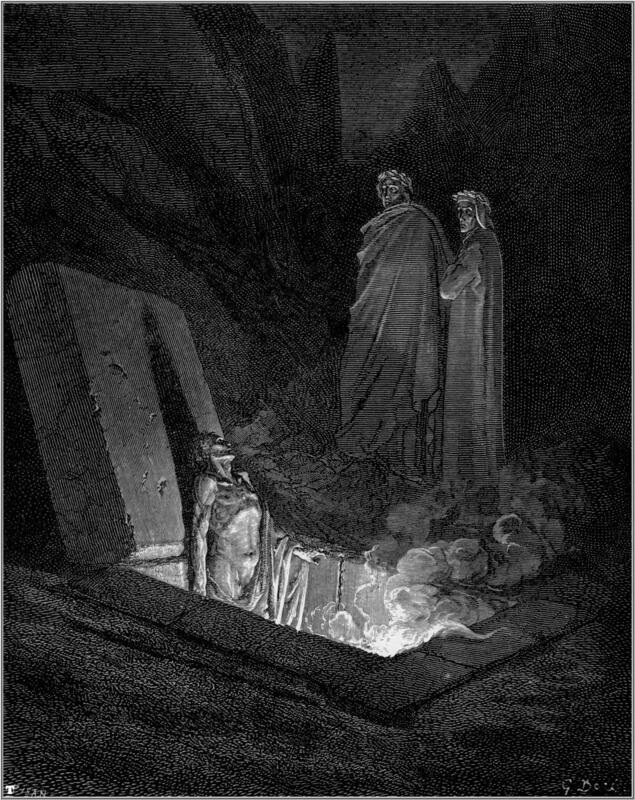 As the “soul” or “essential principle,” a spirit refers to a ghost only when it refers to the essence of a person that should have moved on at death. Its ultimate root is Latin for “breath,” but had become an English “ghost” by the late fourteenth century. wraith - Borrowed from Scottish in the 1510s. spook - Borrowed from Dutch in 1801.
poltergeist - Borrowed from German in 1838, featured previously here. dybbuk - Borrowed from Hebrew in 1903, featured previously here. Manes - deified or venerated spirits of the dead, Roman. Lemures - evil spirits of unburied dead, Roman, featured previously here. 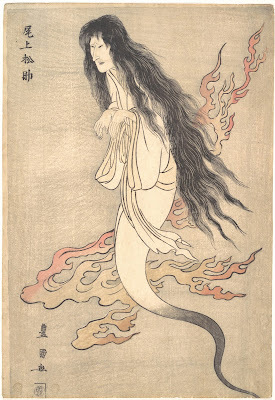 White Lady - Probably the most famous particular kind of ghost, dressed all in white and often the spirit of a woman who was betrayed by a lover. Legends of White Ladies date back at least to the medieval era, but many of the more recent White Ladies seem to have been killed in car crashes. Why so many? Apparently spirits of the dead are a major preoccupation about which people have spent a lot of time talking over the centuries. So you see that no matter what sort of hauntings you may encounter this Hallowe’en, the English language leaves you amply equipped to discuss them. 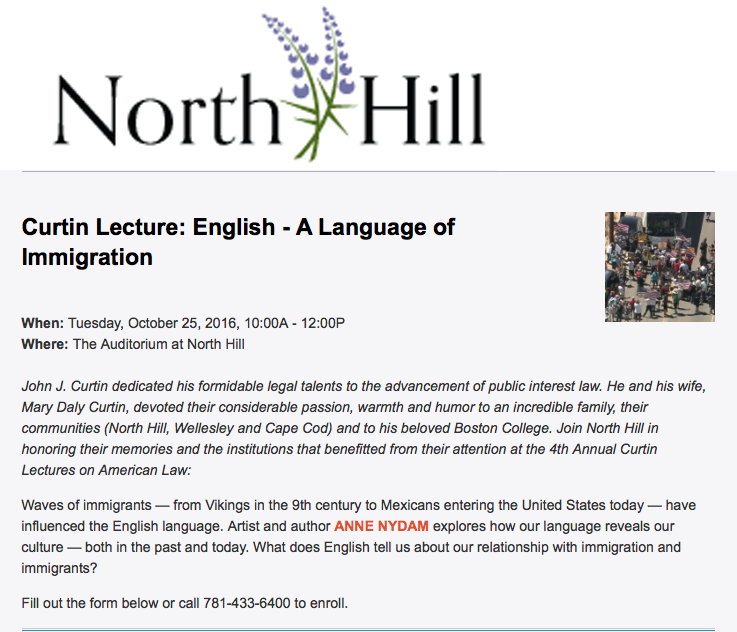 This morning I gave a talk about the effect of immigration over the centuries on the English language. Not surprisingly, since this is really interesting stuff, the audience had all kinds of questions and thoughts on the matter, the room was overflowing, and the question period ran to the end of our allotted time. Much fun was had by all! 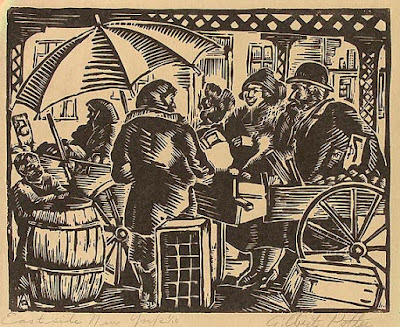 So for today’s blog post I thought I’d do a quick search and see what relief block prints depicting immigrants I could turn up. I was pleased to find some very cool ones to share. First, this view of the Jewish immigrant neighborhood of New York City’s Lower East Side. The artist, Albert Potter, was an immigrant from Russia, although he grew up in Providence, Rhode Island. I love the framing of the overpass bridge. I’d also like to point out that the prices on the pushcarts are backwards - yes, it can happen to anyone making a relief block print! The next artist is also an immigrant, a Bahamian who lives part time in the United States. His piece is darker and more dense, showing immigrants on the move, picking up what they can carry and going. These people are strong and determined, and those of us who have never been immigrants should imagine ourselves in that situation and appreciate what it takes to pick up and move your whole life. The people are depicted entirely in thin outlines and sketchy white highlights so that the crowded carving reflects the crowd of people. 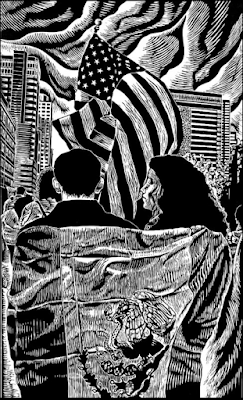 Finally, an image of Mexican immigrants in Milwaukee made by Raoul Deal. (I don't know whether he's an immigrant, as well. I couldn't find a full biography.) 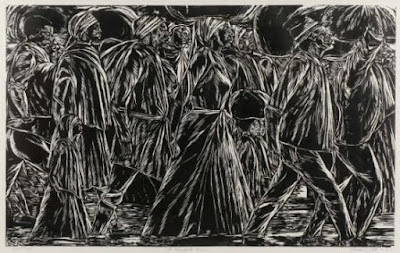 Apparently this woodcut is quite large, so I’m sorry I can’t get the full impact of it by seeing it small on my computer screen. The people in this image are sandwiched between the Mexican and USA flags, representing that feeling of being between. I can imagine from their postures the love and aspiration they feel toward their new country, and the enveloping beloved identity of their old home. The issue of immigration has, of course, been a hot topic recently, with much hysterical rhetoric. It’s complicated and messy, I know, with lots of concerns that must be addressed and needs that must be balanced. But I confess that I cannot help but see immigrants as simply people: human beings who just want what all humans want - to have food and shelter, to feel safe, to have meaningful work, and to care for those they love. 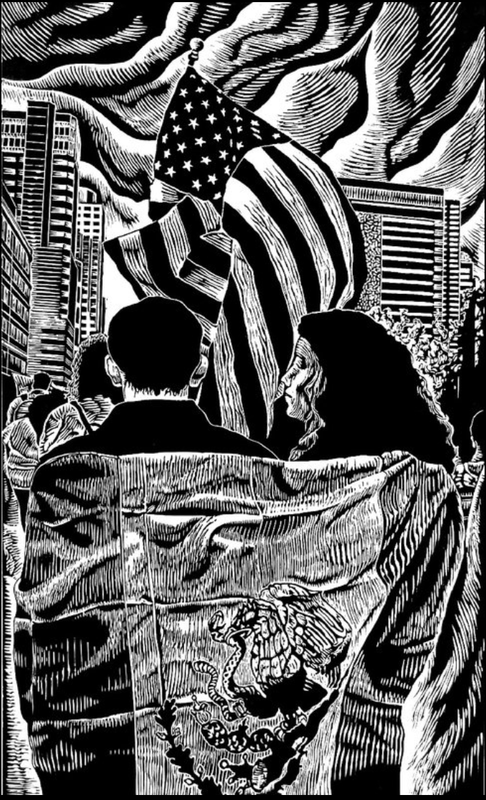 These things shouldn’t be too much to ask, and I like how these three wood block prints focus on the humanity of their subjects, something we must never lose sight of no matter how difficult the situation. Today is Ursula K. Le Guin’s birthday, worthy of celebration as she’s a towering figure in speculative fiction, particularly in the idea of making speculative fiction into a form every bit as serious, thoughtful, and well-written as “literary fiction.” (Indeed, she loathes all these genre divisions and the intellectual snobbery that always seems to go along with them.) Le Guin has experimented for some 60 years with using speculative fiction to make us consider our own universe in new ways, as well as with writing simply beautiful prose. She also writes poetry, and since it seemed about time for more poetry here, I thought I’d share one of Le Guin’s fantasy poems. But as I went looking through my various sources, I find that while much of Le Guin’s poetry is set in fantasy worlds (indeed Le Guin was a major influence on me in my youth in the matter of using the everyday poetry of life in world-building) most of it concerns life and death, the deepest things and the most ordinary things, that are true in every universe and thus not exclusively fantastical. And as I read through poems this morning it was this silly, flippant piece that tickled me. This creature must clearly be some relative of the pushmi-pullyu, the double-ended gazelle-chamois-unicorn cross from The Story of Doctor Dolittle by Hugh Lofting. 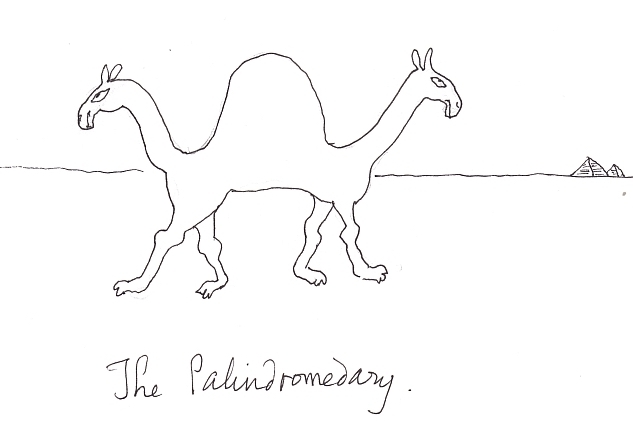 The pushmi-pullyu, however, is generally a happier beast than the palindromedary, though terribly shy. 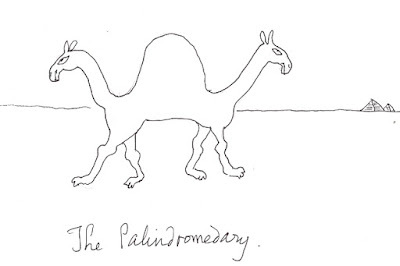 As for me, I’m a fan of palindromes as well as dromedaries, so I’m very sorry to see the palindromedary so mournful! Happy Birthday, Ms Le Guin! P.S. It's Roslindale Open Studios this weekend. Be there if you can! I’ve been too busy with preparations for upcoming events to write anything insightful. Indeed, last Friday it turns out I was too busy even to post - too busy even to notice I'd never posted, until I sat down to the blog this morning. So I’ll just share the schedule and if anyone is in this neck of the woods, come see me at one or more of these events. I promise I’ll be wonderfully insightful in person! 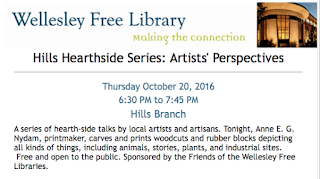 This Thursday, October 20 I’ll kick off the Hills Hearthside Talks series at the Wellesley Hills Branch Library. This year the theme is “Artists’ Perspectives,” and I’ve prepared a slide show and demonstration about relief block printmaking. The little Wellesley Hills branch is a cool old building and the titular hearth has been restored to its rustic historical glory. Its stone surround and mantel could frame a mighty blaze, although I’m told that fire regulations prohibit actually lighting a fire in it! My talk and demonstration will be the basics of relief printmaking, and then a little about my particular focus and inspirations. Rumor has it that there will be light refreshments. 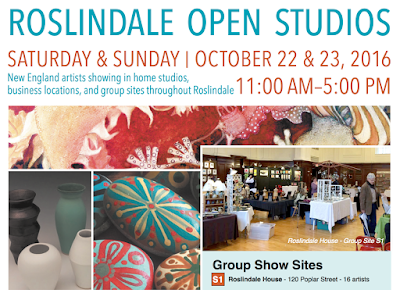 This weekend will be Roslindale Open Studios. Most years this is my show with the biggest crowds, and there’s always a great buzz in the air. They’ve changed the dates this year, so I don’t know what difference that will make, other than my having to work two weekends in a row! But I’ll be in my usual location, the big auditorium at Roslindale House, which has stately architecture and a large group of artists showing a wide variety of media. I don’t yet have a block prepared to carve, so I need to rack my brains and come up with something to demonstrate and keep me busy. Any ideas? October will end with a program at North Hill in Needham on Tuesday, October 25. This one will be concluding the Curtin Lecture Series, and I’ll be there not in my artist hat but in my linguist hat. 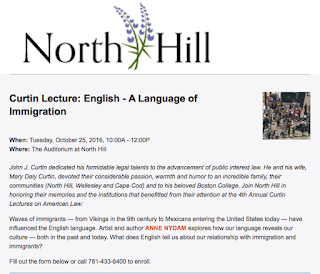 The topic is the effect of immigration on the English language, and how the language we speak reflects past generations of immigrants, and past generations of English-speakers’ attitudes towards immigrants. It’s a fascinating topic and I’ve really been enjoying preparing my talk. And then I’ll get a few weeks’ break before my next open studio, in November. It’s really exciting to have all these great opportunities and it makes me very happy to get the chance to talk with people about art and language… but this was never supposed to be a full-time job, so if I’m still anything resembling sane by the time we get to Thanksgiving, it’ll be a big relief. Follow the links for more information about any of these events, and I hope to see some of you there! 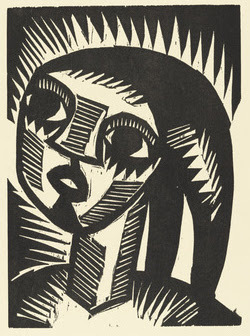 Today is International Day of the Girl, so I’ve got a wonderful woodcut of a girl. I’m always a little ambivalent about these days for important causes - I mean the day of the girl? Just one? The other 364 days of the year we don’t need to worry about girls at all? On the other hand, of course, there are many places and situations in which one solid day of bright spotlight on the needs of girls is a big improvement over what they might be getting otherwise, and baby steps are certainly better than none at all. 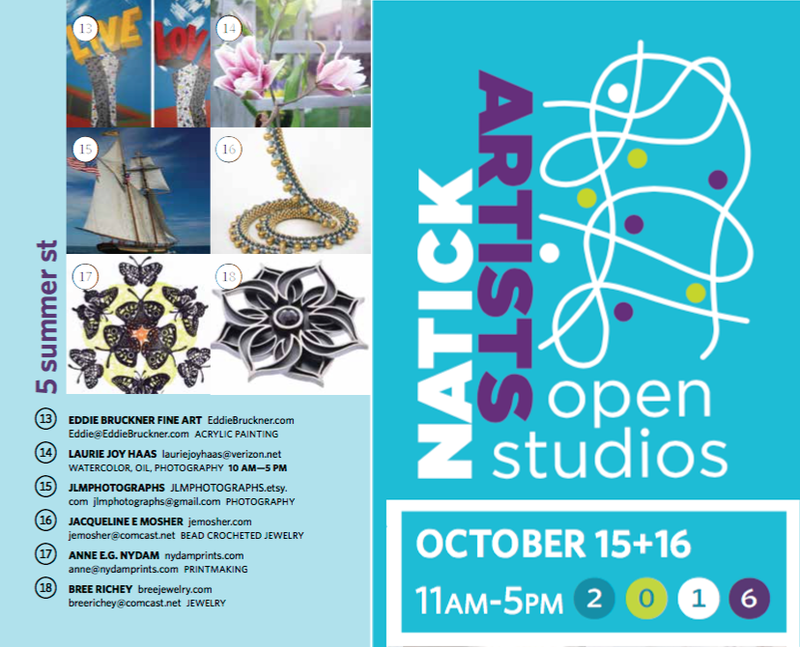 Don't forget, Natick Artists Open Studios is this weekend. If you'll be in eastern MA, come by and visit me, and see all the other wonderful artists who will be exhibiting in town. I'll be at a new location this year, so I hope to see lots of visitors there! 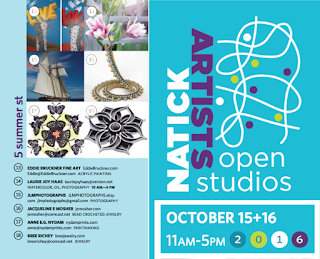 Also, the following weekend will be Roslindale Open Studios, so if you can't make it to Natick, how about Roslindale? I’ve done lots of previous posts about alphabet books illustrated with relief block prints, but I just received a review copy of a lovely counting book illustrated with wood block prints, so now’s the time to do a post on the handful of block-printed counting books I’ve found, starting with the brand new one. The illustrations - watercolored woodcuts of nature scenes in double-page spreads, each one with a north star up in a corner. I see more of Bowen’s rougher style than Prange’s in these illustrations, although perhaps Prange gets credit for some of the more unusual viewpoints, such as the view of the river from underwater looking up. (I wouldn’t have minded a note in the back about how these two wonderful artists collaborated!) The later numbers get quite complicated and will definitely challenge children to find and count everything. What’s special about it - Each page introduces a new number, but also counts down all the previous numbers. 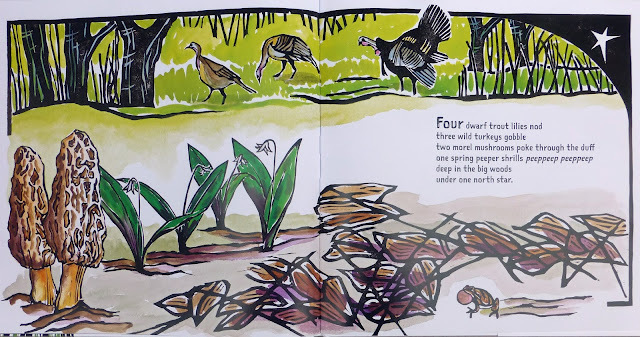 Unlike most cumulative verses, however, every number represents a new animal or plant each time instead of repeating the previous pages’ animals, leading to a huge variety of different species over the course of the book. Also, each page, with all its appropriate plants and animals, is set in a different Minnesota habitat. Finally, humans are reminded that we live under the North Star, too. It counts from 1-10, and includes at the back information and scientific nomenclature for all 55 species, as well as information about the habitat areas, and instructions on how to find the North Star in the night sky. There’s a lot of great natural history here for any curious child. 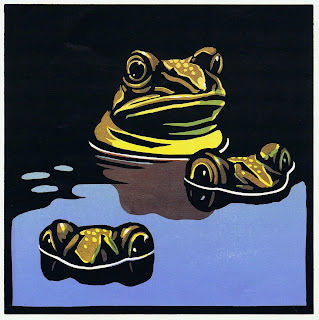 The illustrations - richly colored multi-block linoleum prints, set apart on single pages. I always love Wormell’s dramatic depictions of animals. What’s special about it - Rather than showing numbers of animals, this book counts parts, such as 4 giraffe legs, 10 bear claws, and 14 rings on the lemur’s tail. It counts from 1-20, and includes at the back a sentence or two of information about each of the animals featured. 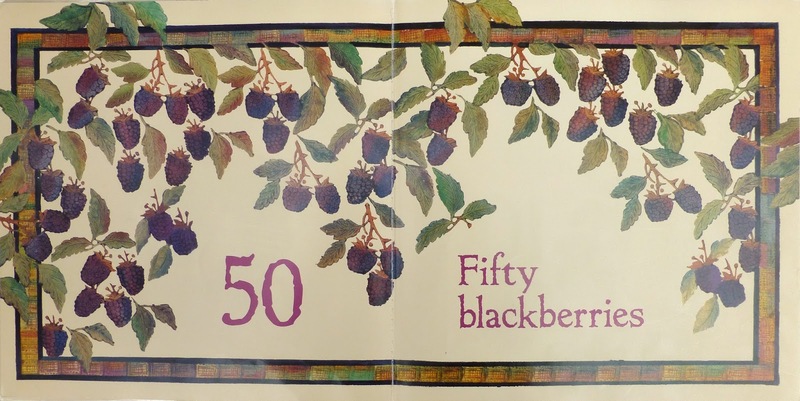 The illustrations - detailed potato prints in warm autumnal colors, with decorative borders framing each numbers’ grouping. Each number is represented with fruits and vegetables, along with their leaves and occasional sunflowers for extra decoration. What’s special about it - It counts from 1-10, but also shows 20, 30, 40, 50, and 100, a bonanza for the child who loves to count! At the back there are instructions for potato printing. 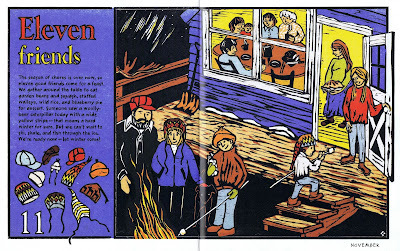 The illustrations - brightly watercolored woodcuts of nature and farm-yard scenes in double-page spreads, each one featuring the eponymous cat. What’s special about it - This includes a very simple story in rhyming text with a repetitious refrain, counting all the small animals the Barn Cat sees. It counts from 1-10 and ends with the cat getting milk. 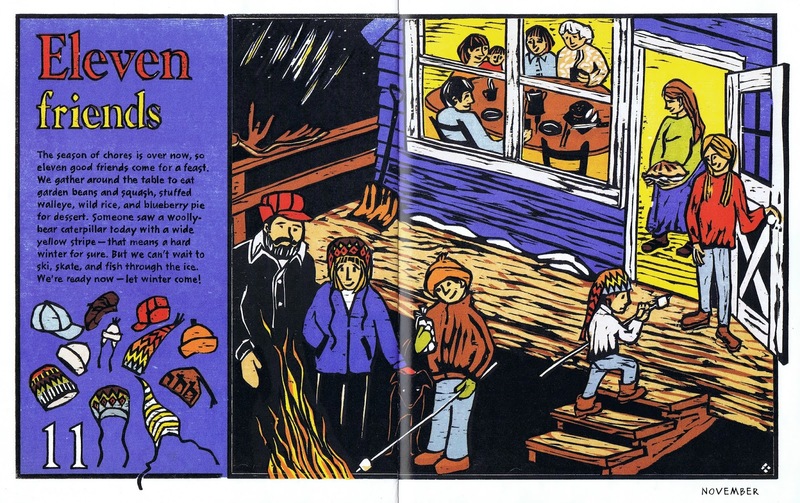 The illustrations - multi-block multi-color woodcuts of scenes of people in the north woods, with sidebars framing the text and a simplified picture of the countable objects. I’m a big fan of each of these illustrators, and they’re all beautiful books. All of these artists except Beckie Prange have also done alphabet books, which you can see more about here. (Come on, Prange: it’s your turn now!) I’ve been toying for some time with ideas of doing my own animal counting poster, or possibly a book, so it’s fun to see some of the different ways others have approached it. 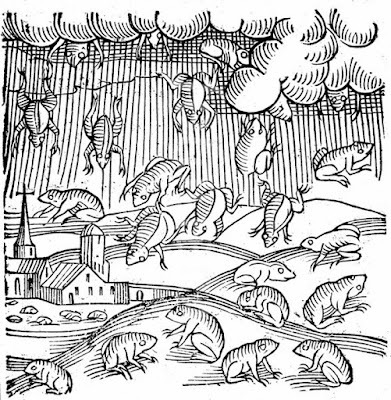 Rains of frogs, fish, and other unusual things are the stuff of spells, omens, apocalypse, and magic. They’re clearly unnatural, irrational, and impossible, so they make a great magical element for prophesies, curses, and fantasy worlds. However, there’s just one thing: they really do happen. 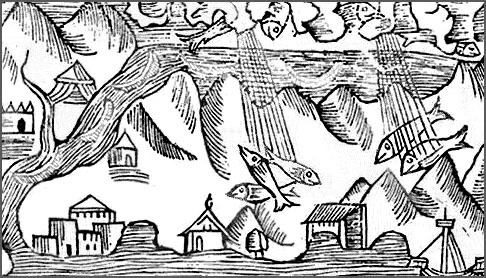 Strange things have been known to fall with the rain not only in the distant, credulous past, but right up to the present, and not only in the distant, superstitious hinterlands, but all around the world and in well-populated areas including London. Scientists, of course, have come up with an explanation involving tornadic waterspouts. The idea is that vortices of air cause low-pressure zones that can lift up small, lightweight objects including frogs and fish. 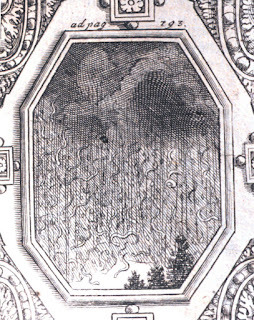 The mini-tornadoes travel along, carrying their aquatic passengers (which may or may not be surviving the experience), until eventually the pressure drops and the foreign objects rain down on a surprised populace. In 1919 Charles Fort, famous sceptic of scientific claims of understanding and explaining everything, pointed out that rainfalls never seem to be a mix of species and other aquatic debris. 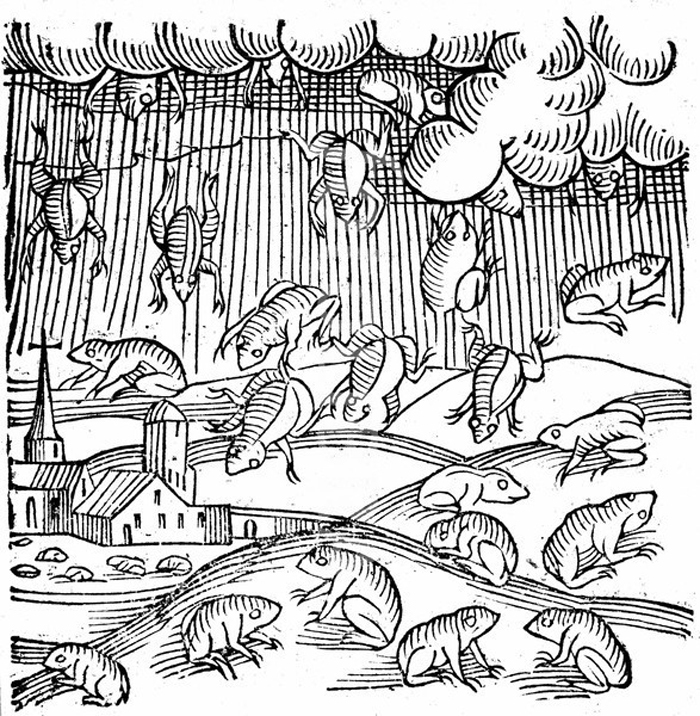 Furthermore, he objected, no one ever reports on seeing frogs getting sucked up, only on seeing them rain down. No one ever seems to have documented a complete cycle of this unusual weather, so perhaps there remains something a little uncanny about it. be swimming along merrily until their precipitation. Finally I have a rain of snakes, far more torrential altogether, with fiercer clouds and more driving rain. On the other hand, this could be in the wilderness. All we see are trees with no evidence of a town or human habitation to be snaked upon. 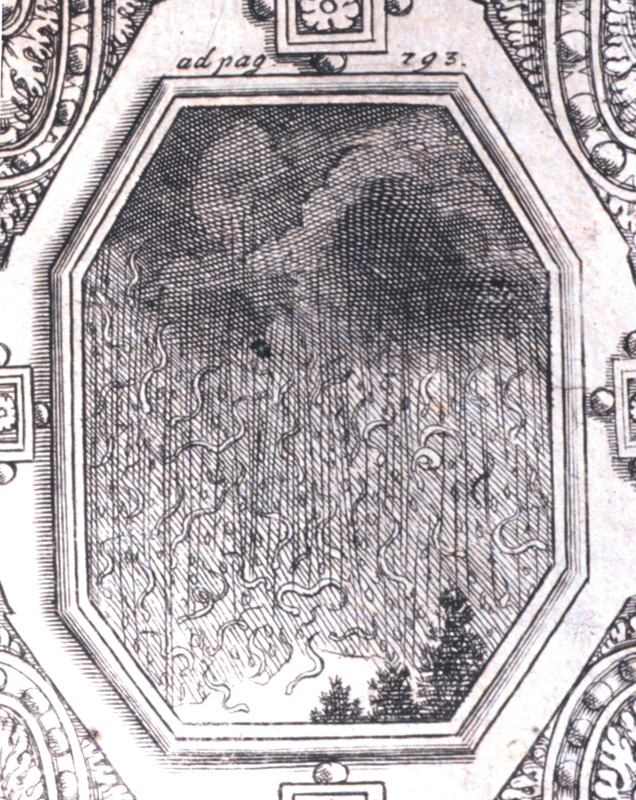 I feel that this post wouldn’t be complete without mentioning one of the better-documented modern instances of such strange weather phenomena. In 1982 weather girls in the US reported that with humidity rising and the barometer getting low, according to all sources, at just about half past ten for the first time in history it started raining men. For complete details, listen to the report.